just been through the pain of camping and farming all the drops for this. Dont bother doing it, with most the drops being uncommon to rear you would think if you did the time you might get some benifit from it. but nope. stick with your trophys as these do not stack, and if you were thinking like me cool, now that 500 triv item look like i got a shot at, max your salvage. ome on sony how about making these items stack or are you just going to keep rising triv and make it so that items in future additons have a 1% chance of working. 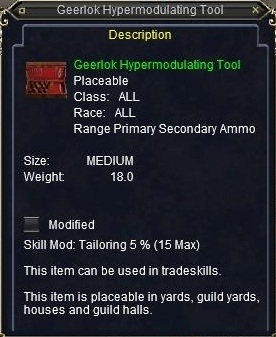 and if this and say •Geerlok Hypermodulating Tool stacked as well it would be 300 + 25% = 375.